City administrators must find the very idea of becoming a smart city quite overwhelming. For many of them, it is a completely new field of expertise. It calls for practical knowledge of change management procedures, cross-organizational innovation and a raft of new technologies. The smart cities concept raises many more questions than answers. For example, what exactly is a smart city? Who decides what projects are initiated? How will any initiative be funded? And how will cities deliver new, smart city services without impinging of already tight city budgets? Politicians and solution providers learn from the examples set by leading cities such as Barcelona, Copenhagen and London. With the smart city phenomenon gaining in momentum, there are growing expectations for cities to act. However, it is difficult to seize the initiative when cities see more red flags than green ones. Deployment of any broad-based smart city initiative can also turn into something of a liability; there are definite up-front costs and relatively little data, so far, to show viable gains. Cities are therefore experimenting narrowly, via smart streetlighting, for example, or in line with politically driven objectives. From some of the stories I have heard over recent months, cities seem to be treating the investment challenge with something of a “free lunch” mentality. Earlier this year, one city authority ran a beauty contest with a group of smart city software startups. The city wanted to select the one startup that made the best support (i.e., subsidy) offer. This approach rings all the red flags that characterize a high-risk procurement. Talk about putting all one’s eggs in a basket that’s being built on the fly. Large cities, with well-connected officials, can take on more risk and encourage higher levels of innovation. It was impressive to hear a firsthand account of some of Los Angeles’ smart city experiments from Peter Marx, its former chief innovation officer. With its population of about 14 million and concentration of economic activity, Los Angeles is a natural draw for local technology companies, like Google, which can contribute in-kind resources and expertise. The city of Columbus, Ohio offers another perspective on leveraging in-kind contributions to pursue its smart city ambitions. As a winner of the Smart America challenge, which carries a $40 million federal grant, Columbus has managed to multiply its investment capacity to the tune of $500 million thanks to in-kind contributions from local businesses and academia. This is a commendable amount of fund-raising considering the differences in scale between Los Angeles and Columbus. Somewhat dated information from the 2010 U.S. Census illustrated the scale of challenge. 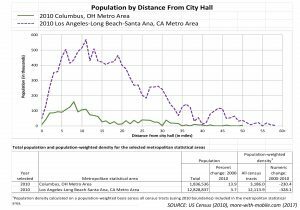 Columbus has a population one-seventh that of Los Angeles, albeit with a smaller population concentration radius around city hall. One of the many challenges for Columbus, however, is to find economically viable solutions to serve residents who live in low population-density areas some 20-50 miles from city hall. Smaller cities are in a much more difficult situation, lacking the kind of innovation seed funding available to Columbus. It’s hardly surprising to see the competitive dynamic emerging in the smart city arena. Well-funded internet giants perhaps see their own version of a free lunch in pursuing opportunities to assist cash-strapped city authorities by taking on the data-management “liability” in exchange for significant access and rights to city data. The issue that these examples raise is whether the fundamental infrastructure and the deployment roadmap for a broad range and large number of smart city applications and services will emerge from funding linked to special interests. For city authorities, it comes down to a choice between near-term point solutions and a general-purpose smart city capability; there is no free lunch. As Vint Cerf pointed out, smart city deployments are a long-term play and not something that gets done over a month or a year. In contrast, special interests and goals based on the election cycle are typically short term in nature. A small number of the very large cities might find the investment means and policy vision to work their way out of these dilemmas. This is not an implementation choice for the overwhelming number of cities which need to act strategically to leverage economics of scale (pooled funding, shared resources) via partnerships with like-minded cities and townships.